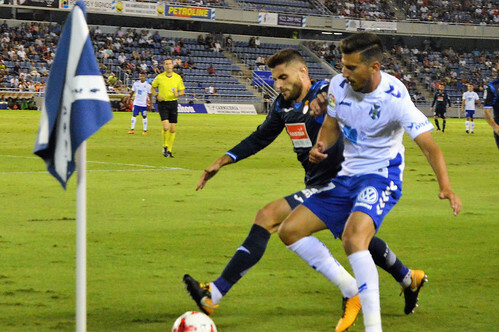 Mobile phones twinkled like stars around the darkened stadium, but after a half hour delay for power failiure, the players of CD Tenerife and Espanyol came out to light up the pitch with a scintillating 0-0 draw in the first leg of their Kings Cup clash. Both teams produced good football, the two goalies were immaculate to deny all that was thrown at them, blimey, even the referee had a good game! 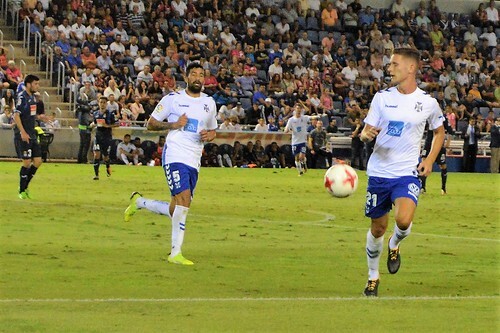 La Liga side Espanyol had a wealth of top flight and European competition to call on but Tenerife had the hunger and some outstanding performances from their young defenders. 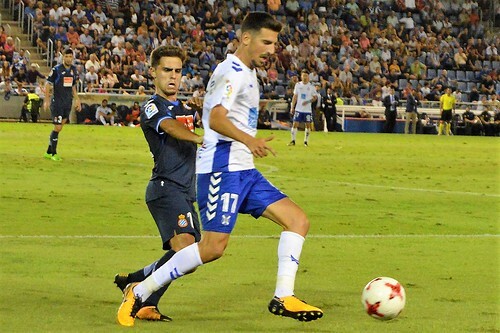 Espanyol opened strongly with Sergio Garcia and Didac sharpening their claws but 21 year old Tenerife B team product Nahuel made the left back slot his own from his first touch, and on the right Luis Perez, just a year older, was also solid and stubborn. In the centre Avedaño supplied the older head but Spain under 21 player Jorge Saenz was in command with a mature and dominant display. 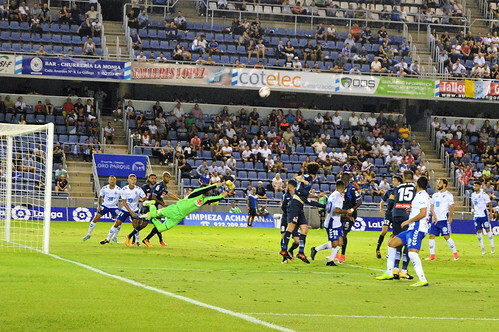 Big things have been expected of 22 year old Carlos Abad, this was the night the Puerto de la Cruz born goalie showed he has the skills to push long term first choice Dani Hernnandez aside. 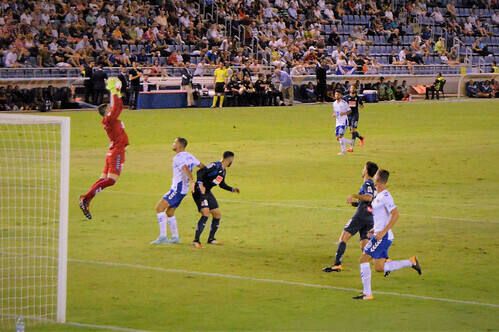 Brian Martin hit a strong early chance at old master Diego Lopez in the visitors goal, the first of many shots that seemed to home in on the keeper but great awareness and positioning help goalies to make it look easy. Bryan Acosta was a powerful creative force in the home midfield and Malbasic was full of running to seek the killer ball. The Serbian striker popped up with a clever overhead kick at the far post only to see Diego Lopez push the ball aside. Bryan Acosta hassled and won the ball before unleashing a shot just before half time, that man Lopez was all over it like a rash. 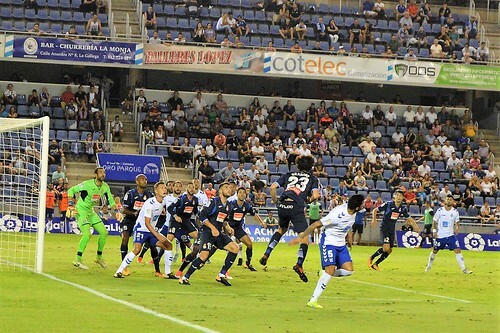 Carlos Abad matched him at the other end to deny Granero, and 13,925 fans were left longing for the second half. 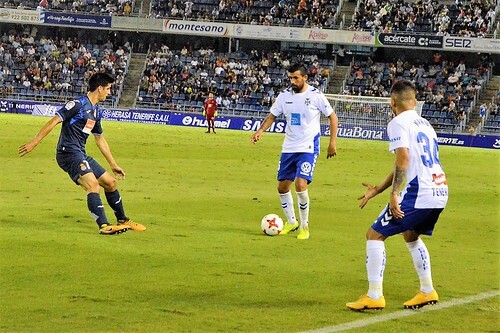 Juan Carlos replaced Aitor Sanz for the second half and the game was soon back to its frantic pace. Brian Martin cut in from the right but needed a bit more surprise in his shot to beat Lopez. Melendo came on for Espanyol and was a mix of sharp tackles and nifty moves, his curled shot gave Carlos another chance to shine. Casadesus took over from Brain Martin, the home grown striker needs to sharpen up but at 21 he has already come a long way this season. And will be back for more. Malbasic powered his way down the left but his cross was a bit wayward, Acosta´s balls in were much more clinical and caused chaos behind the visitors rear guard. 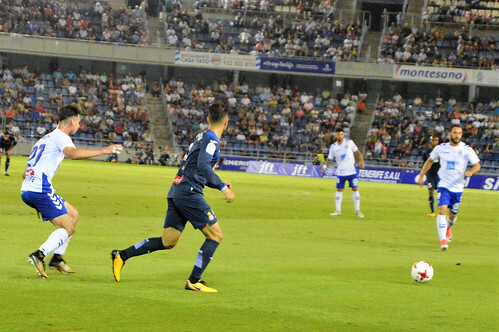 Longo returned to action after a month out injured as Malbasic went off to rapturous applause, the Italian striker was a little rusty but Casadesus had plenty of fire and rose for a fine long header that Lopez took cleanly. At the other end Carlos pulled off two class saves in succession, it seemed a draw was pre ordained. Acosta had the final effort but it went like a magnet to Lopez. There was just two minutes of injury time, although all the fans yearned for more. The away leg in four weeks time will be tougher, with Tenerife again the underdogs, but few will forget the home night that started like a pop concert and ended with the support act stealing the show.